Hi everyone, today I'm here for Craftie Cafe and for this card I’ll be using the Hay There stamp set from Lawn Fawn once again but this time, I’ll be creating a simple ‘Hello’ themed card instead of a birthday card. 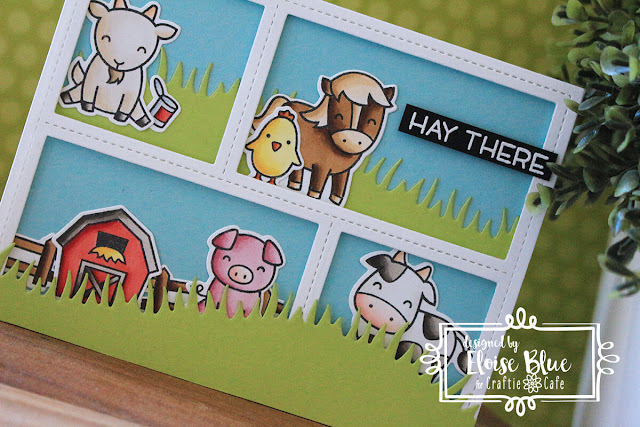 I’ll also be pulling in the Peek A Boo Backdrop Dies as well as Grassy Hillside Borders Dies to finish off my card today. To begin my card today, I started off with colouring in my images. I used my Copic Markers and then used all the coordinating dies to cut them out. I set them off to the side and worked on my background. I decided to go super simple and to cut a simple blue background from some plain cardstock and adhered my frame from Peek A Book Backdrop overtop. 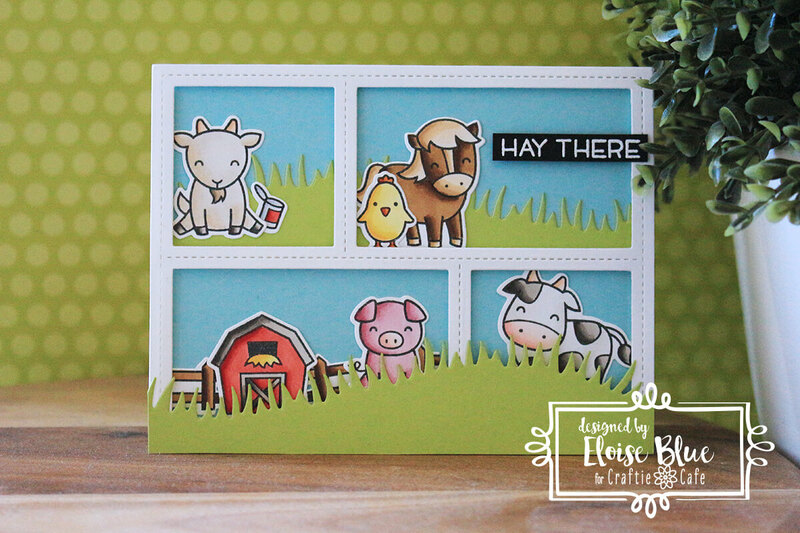 I then used the Grassy Hillside Borders Dies and cut two strips out of some green cardstock as well. I adhered them on both “layers’ of my peek a boo frame for my scene. I then used my critters I had coloured earlier and adhered them all into place, tucking behind the grass borders sometimes for added effect. Once my scene was adhered together I adhered the entire panel to a card base. For my sentiment, I white heat embossed the ‘Hay There’ sentiment from the same stamp set onto a strip of black cardstock. I adhered it onto the right hand side and my card was complete. Thanks so much for stopping by today and I’ll catch you all next time.